Bambo Nature Nappies are breathable and highly absorbent. They are 50% bio-degradable and free from harmful chemicals. They have the Nordic Eco Label so are a great environmental choice. Scroll down to read more about these popular eco disposable nappies. Beaming Baby Bio Degradable Nappies are 33% MORE Bio degradable including Packaging than Bambo and have 38% less chemicals! They have a starch based super absorbent core, and efficient leakage barriers to minimise leaks and to ensure your baby's comfort. The breathable backsheet on the Bambo Nature nappies ensures that your baby's skin can breathe. Bambo nappies are easy to adjust; hook and loop fasteners can be opened and closed as often as necessary. Bambo nappies are easy to fit due to flexible side panels, ensures increased comfort and freedom to move. August 2010: NEW & IMPROVED! Bambo Nature nappies now have extra stretchy, super-soft tabs, instead of an elasticated waist which is more eco-friendly as there is less elastic used in the nappy..
Bambo nappy Maxi-Plus are now slightly larger - if you would like to try a free sample before buying please call us on 0800 0345 672, or email us at orders@beamingbaby.com..
Bambo was established on 1st May 1980 and is a family run business based in Denmark. Bambo Nature nappies use materials sourced via the controlled Scandinavian Forestry, ensuring more trees are planted than felled. All materials used are approved by the Danish Environmental Protection Agency. Charlie has visited the Bambo nappy factory in Denmark where the Bambo Nature nappies are made, and it really is an impressive facility. The factory produces virtually no waste, as everything is recycled. The small amount that is produced is incinerated and provides heating for the local community. 35% of Denmark's power comes from wind farms and 80% of the waste in Denmark is incinerated and used in local heating schemes. 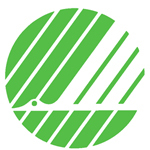 The Nordic Swan Eco Label stands for the highest environmental demands. The purpose of the Swan label is to reduce the impact of everyday consumption on our environment and health. Products marked with the Swan are less likely to cause environmental problems than similar products for the same purpose while offering the same quality. Your health is considered, as there are strict requirements to Nordic Swan Eco labelled products when it comes to the use of additives and chemicals. The Swan criteria apply to the entire life cycle of the products, and all the impacts on the environment are documented in writing. The products must not contain any perfume or other fragrances (e.g. essential oils or plant extracts) lotions or other moisturizers, PVC or phthalates. The Nordic Eco Label is usually valid for three years, after which the criteria are revised and the company must reapply for a licence. In this way, they ensure that products better suited to the environment are constantly being developed.